It’s the start of the day and the stress is already building. There are so many projects on the go, each with a bazillion moving pieces to keep track of. You’re not sure what’s been done yet and what still needs to be finished so it’s a scramble to the finish line. Does this sound familiar? It’s time to end the chaos. The first step? 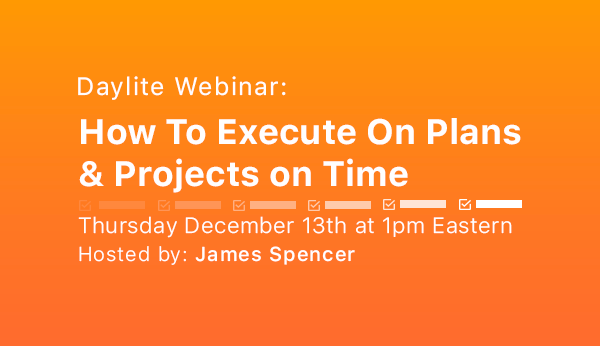 Sign up for our Execute on Plans & Projects webinar. Join us Thursday December 13th at 1pm Eastern to learn how to use Daylite to make your projects & plans run smoother. Spots are limited to register now to save your spot! If you can’t make it to the webinar, no worries, signup anyway and we’ll send you the recording.